Devices able to identify radioactive isotopes by analyzing the characteristic gamma emission spectra. The devices are often multipurpose/multitask instruments able to detect different forms of radiation and perform a variety of functions; used to search, detect and identify radioactive materials. 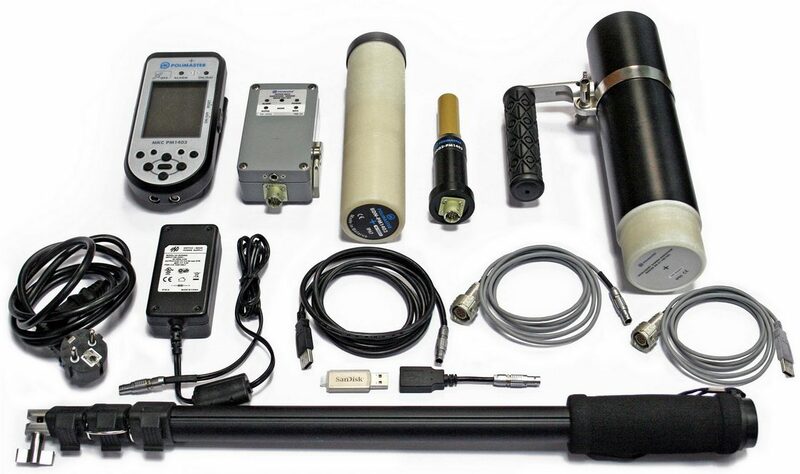 PM1401K-3 is the smallest and the most lightweight instrument in the world able to operate simultaneously as a search instrument, asurvey meter, an alarm device, a surface contamination monitor, and a radionuclide identifier. All radiation sensors are internally incorporated in the instrument's IP65 body. Data such as gamma spectra, doserate, etc are shown on a bright and easy-to-read colour LCD; a belt clip and automatic operation mode allow for hand-free operation, while the user goes about their normal tasks. The instrument's non-volatile memory can store 10000 events and 1000 gamma spectra; data is transmitted externally via a USB port. The instrument incorporates a GPS module. Optional extras include a telescopic extension tube,m a tripod, and Marinelli beakers for measuring radioactivity in water, food and soild samples. · Radionuclide identification (PM1401K-3/3M/3P): The CsI scintillation detector analyses the characteristic gamma radiation spectrum of the radionuclide to identify the radioactive material present. · Search for radioactive sources (PM1401K-3/3M/3E/3P): The high sensitivity of the solid-state CsI sensor aloows search and localization of radiation sources with high efficiency, including hidden sources. · Surface contamination detection and measurement (PM1401K-3/3M/3E/3P): A Geiger-Müller sensor detects radioactiva contamination of surfaces alpha and beta emitting radionuclides. · Measurement of Cs137 specific activity (PM1401K-3/3M/3P): Specific activity (Bq/kg) of the radionuclide Cs-137 can be measured in food, water, and environmental samples. The PM1403 is a multi-application instrument, based on a control unit with an internal CsI scintillation detector supplied with an optional range of external probes to greatly increase the funcionality of the instrument. Data including radionuclide identification is shown on a large colour LCD screen; the device has an incorporated GPS module, and wireless communication by GSM protocol and Bluetooth. Visual and audible alarms alert the user to high radiation levels; optionally, the PM1403 can be supplied with a telescopic extension tube. The PM1403 can be supplied with any combination of the external probe set. Internal probeCsI scintillator gamma radiation probe for the detection, localization, and identification of gamma radiation sources. BDG1 NaI scintillator high-sensitivity gamma radiation probe for the detection, localization, and identification of gamma radiation sources. BDG2 Geiger-Müller gamma radiation probe for the precise measurement of gamma radiation dose rate up to 10 Sv/h. BDN Nuetron probe (He3) for the search, localtion, and measurment of special nuclear materials (SNM). BDAB Alpha(beta radiation probe (proportional counter) for the detection and measurement of surface contamination with alpha and beta radiation emittors.